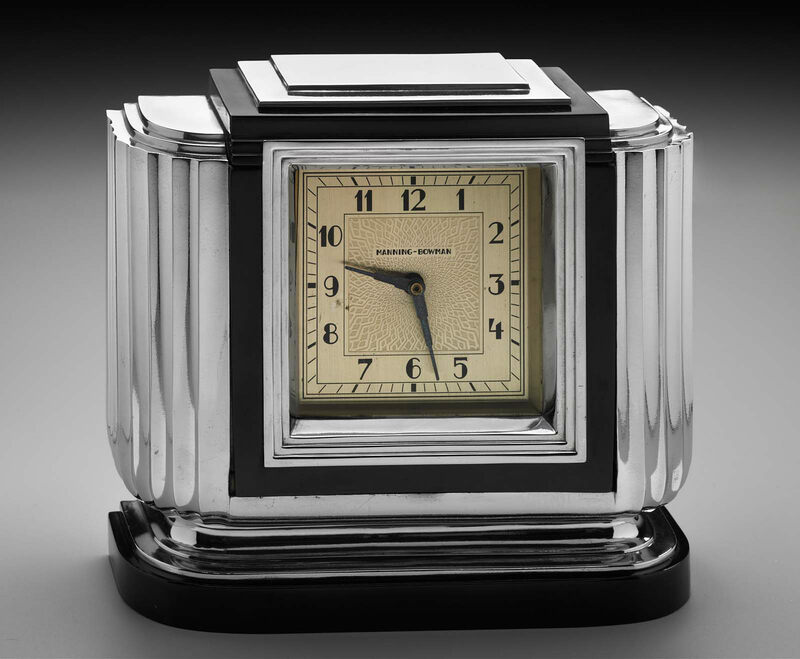 Manning, Bowman, & Co. and Modernism in product design. After two years of documentation recovery concerning Manning, Bowman & Co., still ongoing, the standout of their work seems to be their developing lines toward Modernism from c. 1920-45. 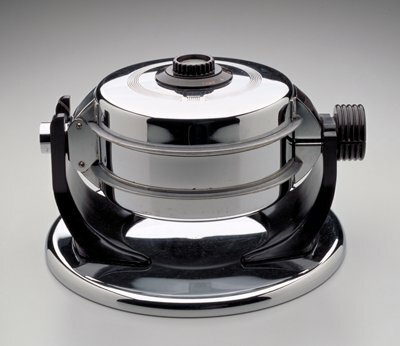 Designs were included in Museum of Modern Art, New York, exhibitions and have been collected by leading museums partly focused on Modernist product design. It seems that the significance of the work in an inter-Modernism context has not yet been assessed. In the immediate area of production in downtown Meriden, CT, in fact within a four-block radius, other important makers of Modernist product design lines include the International Silver Company, with their associated Hollywood radio and TV program featuring many stars, and the Miller Company, their lighting lines, and their cross-disciplinary Painting toward architecture-oriented initiatives, also considered internationally significant. Photo - Historic New England organization, Boston, MA. Offline - Connecticut Historical Society, Hartford. Manning, Bowman & Co. (c. 1899). Cream pitcher. Silver or silver plate. (Cat. no. 2000.7.2116. Viewed 8 July 2018. G02368-69). Photo - Rutherford B. Hayes Presidential Library & Museums, Fremont, OH. Manning, Bowman & Co. (1899-1925). Can. Silver plate. (Cat. no. 2008.109.021ab. Viewed 3 July 2018. G02198-99). Photo - Grey Roots Museum & Archives, Owen Sound, Ontario, Canada. Historic New England organization, Boston, MA. Manning, Bowman & Co. (c. 1902). Stein. Pewter. (Cat. no. P2012.08. Viewed 28 August 2018. J00190). Photo - Pennypacker Mills, Schwenksville, Pennysylvania. Photo - Historic New England organization, Boston, MA..
Photo - Yale University Art Gallery, New Haven, CT.
c. 1904 - "sprit lamp"
Manning, Bowman & Co. (c. 1904). "Sprit lamp". (Cat. no. KM.05550a-c. Viewed 14 July 2018. G02726). Photo - Stiftelsen Nordmøre Museum, Kristiansund, Norway. Manning, Bowman & Co. (c. 1906). Toaster. (Cat. no. 2012.3.3. Viewed 14 July 2018. G02705-07). Photo - American Precision Museum, Windsor, Vermont. Manning, Bowman & Co. (c. 1906). Coffee percolator. (Cat. no. 87-95-30. Viewed 6 July 2018. G02384). Colorado Springs Pioneers Museum, CO.
Manning, Bowman & Co. (c. 1906). Toaster. (Cat. no. 81.48.2. Viewed 20 July 2018. C00068). Arizona Historical Society, Museum at Papago Park, Tempe. Manning, Bowman & Co. (patented 1906). Toaster. (Object ID no. H.7254.64. Viewed 4 August 2018. H00284). Click the following link to see the parallel webpage - Manning, Bowman & Company design catalogues and historical documentation. University of Delaware library, Newark. Manning, Bowman & Co. (c. 1915). Toaster. (Item ID no. 959.119.001. Viewed 10 July 2018. G02454-55). Photo - Bruce County Museum & Cultural Centre, Southampton, Ontario, Canada. Manning, Bowman & Co. (c. 1925). 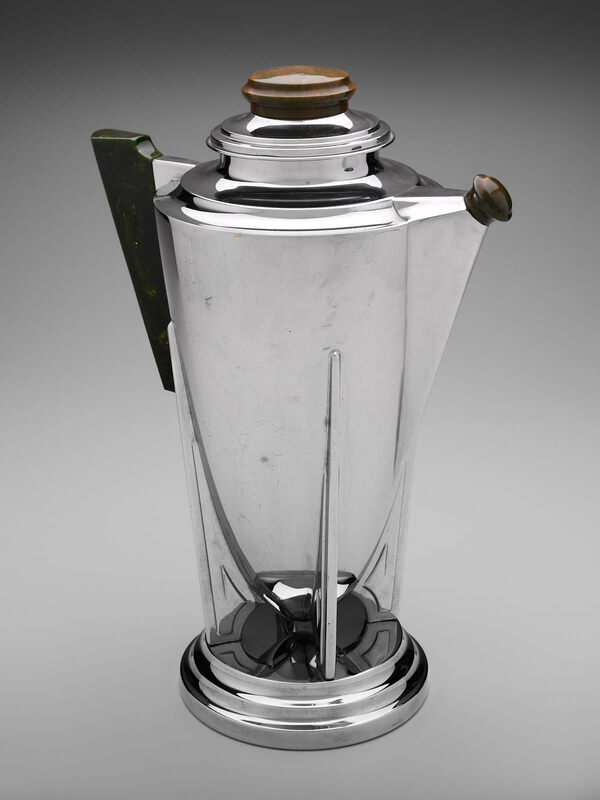 Trophy / coffee urn, patent no. 1,475,334, etc. (Cat. no. 82.74.8. Viewed 20 July 2018. C00066). Manning, Bowman & Co. (c. 1925). Waffle iron. (Object ID no. 87.471.1. Viewed 5 August 2018. H00322). Manning, Bowman & Co. (patented 1926). Tray. (Object ID no. PM.80.19.542. Viewed 5 August 2018. H00321). Photos - Museum of Fine Arts, Boston. Photo - Museum of Fine Arts, Boston. Manning, Bowman & Co. (1928-30). Waffle iron. (Object ID no. H.7490.2. Viewed 4 August 2018. H00285). l’Université Laval, Quebec City, Canada. Manning, Bowman & Co. (c. 1930). Blue enamel coffeepot. (Cat. no. 2017.050.0010. Viewed 25 August 2018. J00098-99). Photo - Adirondack Experience, Museum on Blue Mountain Lake, New York. Manning, Bowman & Co. (1934). Toaster. Metal. (Cat. no. 2007.5.01. Viewed 19 July 2018. G03000). Keeler Tavern Museum and History Center, Ridgefield, CT.
Manning, Bowman & Co. (1934-37). Three-piece coffee service: coffee urn, sugar bowl, creamer. (Accession no. H01695W. Viewed 18 August 2018. L00568-05). Offline - Museum für Angewandte Kunst (Museum of Applied Arts), Cologne, Germany. Manning, Bowman & Co. (1934-37). Coffee urn. (Accession no. H01696W. Viewed 18 August 2018. L00568-06). Manning, Bowman & Co. (1934-37). Four-piece coffee service: coffee urn, sugar bowl, creamer and tray. (Accession no. H01697W. Viewed 18 August 2018. L00568-07). Manning, Bowman & Co. (1934-37). Four-piece coffee service: coffee urn, sugar bowl, creamer and tray. (Accession no. H0 1698W. Viewed 18 August 2018. L00568-08). Photo - Brooklyn Museum, New York. Manning, Bowman & Co. (1935-37). Pitcher. (Accession no. H01706W. Viewed 18 August 2018. L00568-09). Manning, Bowman & Co. (1935-37). Coffee / tea service: percolator, two creamers, sugar bowl. (Accession no. H01712W. Viewed 18 August 2018. L00568-13). Manning, Bowman & Co. (1935-38). Waffle iron. (Object ID no. H.7514.1. Viewed 4 August 2018. H00286). Photo - Cooper-Hewitt, Smithsonian Design Museum, New York. Jay Ackerman for Manning, Bowman & Co. (1937). Coffee percolator. (Accession no. H01707W. Viewed 18 August 2018. L00568-10). Jay Ackerman for Manning, Bowman & Co. (1937). Pitcher. (Accession no. H01708W. Viewed 18 August 2018. L00568-11). Jay Ackerman for Manning, Bowman & Co. (1937). Four-piece coffee service: coffee percolator, sugar bowl, creamer, tray. (Accession no. H01709W. Viewed 18 August 2018. L00568-12). Manning, Bowman & Co. (1937-45). Waffle iron. (Item no. A-179.008. Viewed 1 August 2018. H00152). Photo - Providence Archives, Seattle, Washington. Edward A. Farr for Manning, Bowman & Co. (1940-41). Covered bowl. (Accession no. H01662W. Viewed 18 August 2018. L00568-03). Manning, Bowman & Co. (1940-41). Thermos. (Accession no. H01746W. Viewed 18 August 2018. L00568-01). Manning, Bowman & Co. (1941). Bread basket. (Accession no. H01654W. Viewed 18 August 2018. L00568-02). Jay Ackerman for Manning, Bowman & Co. (1941). Cocktail shaker. (Accession no. H01733W. Viewed 18 August 2018. L00568-15). Photo - Minneapolis Institute of Art. Photo - Museum of the City of New York. Photo - Corning Museum of Glass, Corning NY. Manning, Bowman & Co. (undated). Thermos pitcher and lid. (Object ID nos. PM.80.19.458.A(-.B). Viewed 2 August 2018. H00160-61). Manning, Bowman & Co. (undated). Centerpiece tray. (Item no. A-190.003. Viewed 5 August 2018. H00323). Manning, Bowman & Co. (undated). Coffee percolator. (Accession no. 1991-247. Viewed 18 August 2018. L00606-07). Photo - History San José organization, California. Manning, Bowman & Co. (undated). Casserole dish holder. (Cat. no. 2009.07.26 . Viewed 25 August 2018. J00094-95). Photo - Montana Heritage Commission, Virginia City, Montana. Manning, Bowman & Co. (undated). Plate. Silver or silver plate. (Cat. no. MP.2005.012.108. Viewed 27 August 2018. J00181). Photo - Mordecai Historic Park, City of Raleigh, North Carolina. Manning, Bowman & Co. (undated). Dish cover. (Object ID no. PM.80.19.442. Viewed 5 August 2018. H00320). Manning, Bowman & Co. (undated). Coffeepot. Metal, wood. (Object no. 1996.129.2.A-C. Viewed 9 July 2018. G02427). Manning, Bowman & Co. (undated). Pitcher. (Cat. no. 77-111-11. Viewed 8 July 2018. G02385). Manning, Bowman & Co. (undated). Portable stove. (Cat. no. 1969:69:12. Viewed 8 July 2018. G02383). Mohave Museum of History and Arts, Kingman, AZ. Manning, Bowman & Co. (undated). Cigar lighter. (Cat. no. 1974.18.1311. Viewed 20 July 2018. C00067). Corning Museum of Art, Corning NY. Manning, Bowman & Co. (undated). Double-tray. (Accession no. H01726W. Viewed 18 August 2018. L00568-14). Manning, Bowman & Co. (undated). Household item, perhaps cocktail shaker. (Accession no. H01735W. Viewed 18 August 2018. L00568-16). Manning, Bowman & Co. (undated). Waffle iron. (Accession no. K01533W. Viewed 18 August 2018. L00568-17). Manning, Bowman & Co. (undated). Tray. (Accession no. H01662W. Viewed 18 August 2018. L00568-04). Manning, Bowman & Co. (1898-1906). Six-piece tea and coffee service: teapot, coffee pot, hot water pot, two-handled covered sugar bowl, cream jug and waste-bowl. Britannia ware, enamelled. (Viewed 15 July 2018. G02777). Christie’s New York - Silver (20 SEP 1991). Photo - Christie’s London - From Milan to Rome - The collections of two Italian designers sale (16 November 2011). Christie’s London - Corkscrews (22 SEP 1998). Photo - Bonhams San Francisco - SOMA estate auction (24 APR 2005). 8 September - 30 October 1869. American Institute Fair, New York. > Exhibited unspecified designs by Manning, Bowman & Co., award "for silver plated ware. Third medal and certificate". For documentation online, see the Design Meriden - Manning, Bowman & Co. design catalogues and historical information page. 10 May - 10 November 1876. Centennial International Exhibition, Philadelphia. 1 May - 10 November 1878. Paris Universal Exposition, France. 1 October 1880 - 30 April 1881. Melbourne International Exhibition 1880, Australia. 20-23 September 1881. Meriden Town Hall display, Connecticut State Fair, Meriden, CT.
> Exhibited by Manning, Bowman & Co., "decorated pearl, agate and perfection granite iron ware". 16-19 September 1884. Meriden Town Hall display, Connecticut State Fair, Meriden, CT.
> Exhibited by Manning, Bowman & Co., "porcelain ware and granite iron ware in new styles". 21-25 September 1886. West Michigan Fair, Grand Rapids, MI. 10 October 1889. Exposition at Delavan Opera House, Meriden, on the occasion of the visit of the International American Congress. > Exhibited by Manning, Bowman & Co., 125 pieces of granite iron and pearl agate ware, specific designs unspecified. 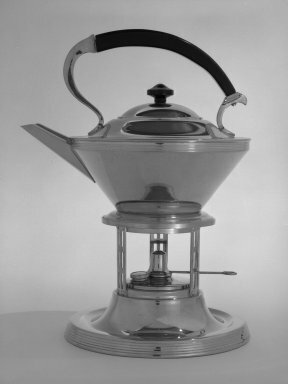 > Unspecified designs exhibited by Manning, Bowman & Co., "nickel-plated and silver-plated merchandise, electrical appliances, glass lined novelties, etc." c. July 1935. New York Housefurnishings Show, New York. 19 - 30 April 1937. Connecticut-made exhibition at G. Fox & Co., Hartford. (Viewed 25 October 2018. C00320-21). > Unspecified designs (irons mentioned) displayed by Manning, Bowman & Co.
18 - 25 February 1939. Connecticut-made week at G. Fox & Co., Hartford. > Unspecified designs displayed by Manning, Bowman & Co.
c. 30 April 1939 - 27 October 1940. 1939 New York World’s Fair, New York. (Viewed 8 December 2018. D00624-33). > Unspecified designs exhibited and / or displayed by Manning, Bowman & Co.
For documentation, see Design Meriden - Manning, Bowman & Co. design catalogues and historical information webpage. 8 - 15 February 1941. Connecticut-made week at G. Fox & Co., Hartford. > Manning, Bowman & Co. (1929-31). Shelf clock, model no. K905. (Yale University Art Gallery collection, listed above). See our Design Meriden compilation listing over 1000 exhibitions since 1851, featuring historical design associated with the Meriden area. On Manning Bowman - 1: designs in collections, exhibitions, etc. | 2: design catalogues, etc.